Dry ice blasting is not a quiet matter. For ensuring the worker protection in your facility White Lion offers the Dry Ice Blasting Box, a straightforward blast cabinet that puts an end to the noise once and for all. The cabinet is made of high quality materials, easy to set up and secure to operate. An exhaust extraction system ensures that the CO2 concentration in the cabin is at a constant low. Supply air is coming in from the factory hall. A window makes it possible to watch the events in the inside and thus contributes to the worker protection inside the cabinet. The interior light is included in the delivery. Therefore the Dry Ice Blasting Box is highly qualified to join secure manual blasting with high comfort. 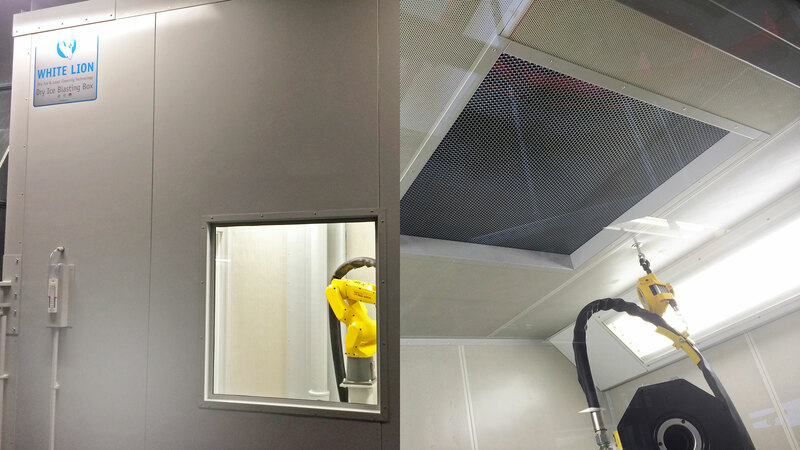 But the cabinet is also suitable for robots – for example in combination with the automated dry ice blasting system WL 5000 Robby. A robot can be taught comfortably from the outside. Your staff does not have to be exposed to the noise of the system. The dimensions of the standard kit when set up are 3m x 4m x 3m. We’re glad to manufacture special constructions with differing dimensions. Further options include a remotely controllable roll-up door and a glas door. You have additional ideas? Feel free to contact us! custom dimensions – Contact us!